When preparing to run a triathlon, there is a fair amount of gear to get to make sure that you can run the race to the best of your ability. That said, there is often an inordinate amount of attention paid to some of the larger pieces of gear, especially those that are worn on the torso of the body. Still, there is actually a piece of equipment that is generally more useful in more legs of the race without sacrificing performance: the best triathlon sunglasses. 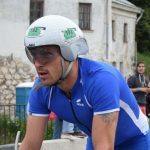 Of course, it is important to note that the qualities that make a great pair of triathlon sunglasses are often the same qualities that make a great pair of running and cycling sunglasses, though triathlon sunglasses need to be able to do both. In fact, because triathlon sunglasses are likely some of the few pieces of gear to be worn for two legs of the race, you could argue that this is actually one of the more important pieces of triathlon gear. Regardless of how you prioritize triathlon sunglasses, figuring out which pair is the best pair for you can be a difficult and confusing task. That is why we have put together a list of the 5 best triathlon sunglasses, highlighting what each one does best. Then we provide a helpful buyer’s guide, so you can find the best triathlon sunglasses to suit your needs. Read on for a guide and a review of some of the best on the market to determine which one will suit you. 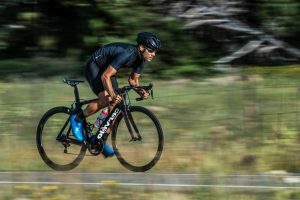 When it comes to sporting sunglasses companies, there are few that can match the quality or the reputation of Oakley which has long since been known as one of the premier manufacturers of sporting sunglasses. Of course, this only makes sense considering Oakley’s history stretches back over 5 ½ decades and has always centered around providing the best sporting sunglasses experience possible. That said, the brand is now one of the many owned by the Luxottica conglomerate and serves to form that company’s premiere sporting lineup. That said, it does not seem to matter all too much in regards to the business structure as Oakley simply continues to impress, this time providing the best optical quality triathlon sunglasses, though the prestige of the brand has a tendency to inflate the cost as well. When it comes to the lenses used for triathlon sunglasses, the Oakley Radar Ev triathlon sunglasses do not provide what most would consider the best of protections. 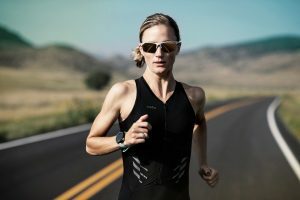 This is not to suggest that the Oakley Radar Ev triathlon sunglasses are poor at protecting your eyes, especially considering they do come with 100-percent UV protection, but they do not come with some of the other protections that one would associate with the lenses like anti-scratch, anti-grease, or anti-dust. Instead, the Oakley Radar Ev triathlon sunglasses aims to provide the best optical quality by using a patented HDO, or high-definition optics, technology. 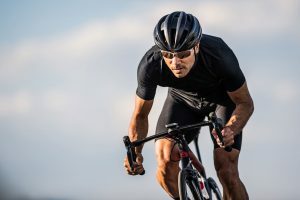 Essentially, Oakley has found a way to provide nearly the same level of optical clarity and magnification through their thermoplastic lenses that you would expect to see from glass lenses without the risks otherwise involved with glass. This leads to the Oakley Radar Ev triathlon sunglasses providing some of the truest accuracy with far less distortion than you normally see from even well-manufactured thermoplastic lenses. Beyond the patented manufacturing process that the Oakley Radar Ev triathlon sunglasses uses to provide the best optical quality that we saw, Oakley also makes it a point to offer proprietary solutions to age-old problems as befits a company of their stature and experience. One of the biggest improvements towards this end is the development of O Matter, a proprietary blend of thermoplastics that offers exceptional torsional strength while also being among the lightest plastics available. This helps prevent the Oakley Radar Ev triathlon sunglasses from being damaged as well as from causing any unnecessary fatigue. To reinforce this focus on comfort, the normally-rubber tips of high-end sporting sunglasses has been infused with another proprietary blend that Oakley calls Unobtanium, itself an inside joke to a popular television show. Regardless, this Unobtanium allows the Oakley Radar Ev triathlon sunglasses to not only repel excess water in general but to actually use that first bit of sweat to trigger a catalytic response making the Oakley Radar Ev triathlon sunglasses stay in place even better. There is no getting around the fact that the Roka TL-1’s will not be the ideal solution for all people, especially those who need more coverage than most. That said, this pair of triathlon sunglasses provides so many features which are almost specifically useful for triathlons and triathletes that it should be an option worth considering even if you are unsure about the coverage. That said, it is worth noting that Roka is actually one of the younger companies on our list with only about half a decade of experience. Still, the company was founded by sporting sunglasses enthusiasts who also happened to be amateur competitive cyclists. From a drive to both find a better solution to their needs as well as improve in their chosen competition, Roka was born and is simply the best performing triathlon sunglasses we saw, prompting us to name it our Editor’s Choice. 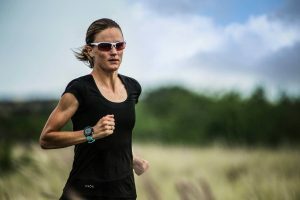 When it comes to any pair of glasses, whether triathlon sunglasses or otherwise, the lenses are without question the most important quality to consider. Whether it is about the maximal amount of protection you can get without sacrificing too much in terms of optical quality or getting the truest, most accurate optical clarity available, even if you have to put up with some inconveniences along the way. 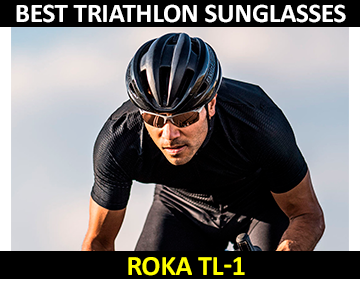 Thankfully, the Roka TL-1 triathlon sunglasses do not believe that you should have to choose between one or the other and offers arguably the best all-around lenses that we saw on any pair of triathlon sunglasses, whether we ultimately reviewed them or not. For one, this begins with Roka’s whip-smart idea to include the Carl Zeiss brand as part of the manufacturing for their lenses. Aside from the fact that Carl Zeiss is widely known as a manufacturer of the best lenses, regardless the type of glasses, it is even more impressive that they were able to do so for lenses made of nylon. On top of the optical quality, the lenses are also hydroleophobic which means that not only do these lenses repel water but they also repel oil, meaning no more fingerprint smudges, as well as dust. Once you have the lenses covered, the next most important quality of triathlon sunglasses will be the frame and fit jointly. It is important to remember that ultimately the fit is more important than the frames, but the frames will inherently influence the fit. To that end, the frames of the Roka TL-1 triathlon sunglasses are superb sporting the popular Grilamid TR-90 nylon material which makes this the only pair of triathlon sunglasses that we reviewed which features exclusively nylon for the primary components of the triathlon sunglasses. That said, Roka does not seem interested in simply meeting the industry standards and sitting pat as it also provides a titanium core to help reinforce the durability of the frame without unduly impacting its flexibility or its weight. As such, the Roka TL-1 triathlon sunglasses have frames which offer the best of both worlds and make another strong push for Editor’s Choice. Finally, the GEKO retention system features a uniquely grooved design for the molded rubber used at the ear pads and nosepiece which provide an excellent grip that is not only comfortable but will not shift in place. The Rudy Project is a unique company on our list in that it is one of the few brands that is generally as much associated with fashion as it is with sporting sunglasses, though it is worth noting that the company was founded explicitly to provide the best sporting sunglasses available. That said, the brand found itself becoming something of a fashion statement and decided to lean into it without taking their focus away from what inspired the company in the first place. As such, this brand is noted for coming up with various specialized technologies, though it does seem the fashion element rubbed off in terms of focus as these are likely for triathletes who do not otherwise need improved optical quality or protections. When it comes to the Rudy Project Tralyx triathlon sunglasses, comfort is the name of the game and these sunglasses offer numerous advancements towards that goal. For instance, the Rudy Project Tralyx triathlon sunglasses features Rudy Project’s patented Powerflow design which uses vents at strategically placed points in the frame to increase the airflow without drying your eyes. Aside from a modest improvement to breathability, this also helps prevent the accumulation of sweat or fogging of the lenses. Beyond the frame the Ergonos IX nosepiece which aside from being made of ridged rubber is also fully adjustable to fit any face. 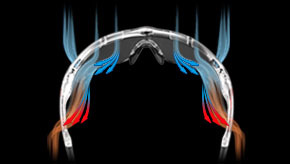 The same sentiment applies to the earpads of the Rudy Project Tralyx triathlon sunglasses as well which are made using Rudy Project’s Adaptive tips which feature both vents as well as a rubberized exterior. Beyond the comfort that these triathlon sunglasses bring to the table, they are also exceptionally convenient able to transition effortlessly in a number of different situations. For instance, this is the only pair of triathlon sunglasses that we reviewed which features a photochromic lens which means that the darkness of the lens will depend on the brightness and intensity of the light. As such, if you are running a triathlon that begins early in the morning when the sun is just cresting the horizon, the lenses will be lighter in shade. 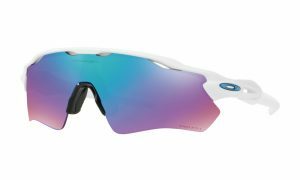 However, as the sun begins to rise throughout the course of the race, the lenses will darken in response, providing you additional protection and shade for your eyes. On top of that, if you prefer a different lens, the Rudy Project Tralyx triathlon sunglasses features a system for changing them out as necessary. Smith Optics definitely did not find its way onto our list the same as most of the other companies that we reviewed did. In fact, Smith Optics was actually founded as a company specialized in the manufacturing of high-end skiing goggles with little to no consideration for either running or cycling sunglasses at all. That said, this is actually the oldest company on our list with a storied history that stretches back over 6 ½ decades and has consistently demonstrated nothing but top-tier quality from the brand. As such, though it may not be the best at any given quality when you consider its price compared to many of the top performers on our list, its quality is still good enough to make the best all-around value triathlon sunglasses. Whenever you are looking for value, you want to make sure that the product in question offers some additional features that are not normally found in its price range. For the Smith Pivlock Arena Max triathlon sunglasses, that value shows up most prominently when looking at the different protections that the lenses provide both for the wearer as well as for themselves. For instance, this is one of the few pairs of triathlon sunglasses that we reviewed which features lenses that are hydroleophobic meaning that they resist water, oil, and dirt making them ideal for virtually any setting or race. Of course, these lenses also provide 100-percent UV protection, so you do not have to worry about bright sunlight damaging your eyes. When it comes to the materials of a great value, you want to ideally make sure that all of the materials are at least the high-end industry standard with maybe one or two made of a proprietary blend that improves on the standard in some way. For more prestigious companies, they will often ensure that the majority of the materials are proprietary, but without specialization, Smith Optics opts instead to primarily stick with the standards. For instance, the frames of the Smith Pivlock Arena Max triathlon sunglasses are made of Grilamid TR-90 nylon while the nosepiece and ear pads are made of hydrophilic rubber. That said, the lenses once again impress as they are made of polycarbonate infused with Carbon TLT which makes them stronger, more scratch resistant, and improves their optical quality as well. Tifosi is another one of those companies that was started not too terribly long ago, though it has been around for a decade and a half, but originated as a brand specialized in the making of sporting sunglasses. As such, they have not yet been able to develop as good of a reputation as some of the other companies on our list, primarily due to a copycat formula rather than genuine innovation. Still, this does present you with a unique opportunity as this means that the Tifosi Jet triathlon sunglasses represent a unique value whereby you can get a pair of triathlon sunglasses with industry standard specs at a fraction of the cost easily making it our best price budget triathlon sunglasses. When looking for a budget-friendly option, it is important to identify the most important qualities of a given product and ensure that there are no major flaws. If you are lucky, you may even find a veritable diamond in the rough where not only does the budget-friendly product not carry with it any significant flaws but it also provides some of the higher-end standards in terms of the market. This is the case with the Tifosi Jet triathlon sunglasses where we see most of the important components adequately manned though they may not necessarily impress too terribly much. For instance, this pair of triathlon sunglasses provides some of the best coverage that we saw with a lens that is 3” tall and features a wrap around style. On top of that, the lens also provides the requisite 100-percent UV radiation, so you do not have to worry about damaging your vision during races on brighter routes. Finally, this is the least expensive pair of triathlon sunglasses that we could find with also featured an integrated hinge, so you do not have to worry about the Tifosi Jet triathlon sunglasses breaking anytime soon. Once again, when considering a budget-friendly option, the main point is to ensure an absence of weaknesses, and once again the Tifosi Jet triathlon sunglasses makes it a point to offer a bit better than simply the standard for many of these materials. For instance, while the Grilamid TR-90 nylon material may seem like an industry standard for the frames, that is only true amongst the higher-end sporting manufacturers. This same statement is generally true for the nose pieces that are made of a hydrophilic rubber to prevent the build-up of sweat and slipping off the triathlon sunglasses. In fact, the only material used which does not exceed the basic standards for sporting sunglasses, in general, are the lenses which are still made of shatterproof polycarbonate, though they have a tendency to fog up easier than most. As opposed to most gear and equipment worn during a triathlon, triathlon sunglasses are one of the few pieces of gear where the fit is not the most important quality, though it is, of course, still fairly important. Instead, the most important aspect of triathlon sunglasses to consider is the lenses and most importantly the lens material. The material will impact a number of qualities, but the most important one to consider is the optical quality and the durability, though the protections will be incredibly important as well. It is important to note that polycarbonate is a type of thermoplastic, as are all of the materials used for triathlon sunglasses lenses. Polycarbonate – This is easily the most common material used for the lenses of a pair of triathlon sunglasses for a fairly good reason. Out of all the materials used for triathlon sunglasses lenses, polycarbonate is the least expensive, though the difference between the price of most triathlon sunglasses lens materials is negligible until you reach the high-end spectrum of the market. Still, polycarbonate is an incredibly versatile material to use for triathlon sunglasses lenses as it provides a surprisingly clear and true optical quality when compared to most other materials. On top of that, polycarbonate is often touted as a shatterproof material and it does provide an incredibly durable material with particular strength against impact damage, though it is worth remembering that polycarbonate is far more susceptible to scratches than most of the other materials used in the manufacturing of triathlon sunglasses lenses. Polycarbonate also forms an excellent substrate for various treatments to improve the protective qualities of the triathlon sunglasses as well. Finally, polycarbonate is an extremely lightweight material which prevents it from adding to the already sizable fatigue that is part and parcel of any endurance race. Nylon – Out of the materials commonly used for the manufacture of triathlon sunglasses lenses, nylon is actually the least common. This is likely due to the fact that it sits between the other materials in terms of various qualities without having a true niche. Instead, nylon serves far more as an incremental improvement over polycarbonate without a meaningful increase in cost such that it does not move the needle within the market. Still, if you are looking for a better performance than polycarbonate without wanting to spend as much money on the high-end materials, nylon is a solid choice. It can provide the same optical quality as well as nearly the same level of impact resistance. Moreover, nylon is inherently far more resistant to scratching than polycarbonate without sacrificing its lightweight build or ability to be infused with a number of other protections. It is worth noting that for triathlon purposes, nylon could be argued to be a better material for triathlons as you are far more likely to have to deal with scratches than you are the impacts that polycarbonate protects from. Thankfully, nylon has roughly the same level of torsion durability, so the nylon lenses will bend and flex about as much as the polycarbonate ones will. Tivex/SR-91 – If you absolutely have to have the best material used for triathlon sunglasses lenses, then SR-91, which is sometimes called Tivex, is the only material for you. 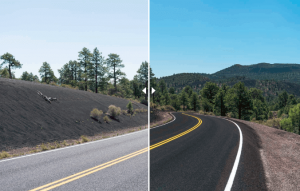 For instance, though both nylon and polycarbonate can achieve a fairly impressive level of optical quality, SR-91 can achieve a far better level of true representation with optical clarity and accuracy near Zeiss lens levels of quality. On top of that, the SR-91 lenses are easily the most durable type of lenses that we saw able to provide an impact resistance that is orders of magnitude stronger than any of the other materials. The same relationship applies to both the scratch resistance and the torsion resistance of SR-91 making it by far the strongest material that you can reasonably expect to find. SR-91 unsurprisingly tops the list in most of the other relevant categories as well such as providing the best weight to strength ratio by far and not being significantly different in terms of weight compared to polycarbonate anyway. As important as the material of the triathlon sunglasses lenses may be, they are primarily used as much to protect you from the sun as anything else. To be fair, a pair of triathlon sunglasses that merely provided you some cover from the sun as you compete is actually a fairly low standard for triathlon sunglasses. This is especially true considering you are likely to be exposed to a serious amount of sunlight that can have long-term effects if you are not careful. On top of that, there are some other types of “protections” which are truly more designed for convenience as they actually protect the lenses and not so much the wearer. Finally, there are other protections that are often advertised as meaningful, and they may be in other contexts, but are not truly useful for most triathletes. 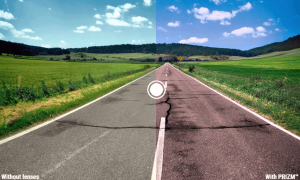 UV – This is by far the most important type of protection to look for and is literally the reason that sunglasses exist in the first place. That said, it is important to make sure that the triathlon sunglasses offer complete protection from UV radiation and not just partial protection, protecting you from types of UV radiation but not from others. For instance, all sunglasses which advertise protection of UV rays inherently include UVA rays. That said, UVB rays are actually more damaging to the eye, and not all manufacturers disclose if their UV protection includes UVB rays. Finally, there are even UVC rays, though these are the least plentiful, though technically the most damaging. That said, these rays are most prominent during dawn and dusk, so you only have to worry about it then. As we can see, there is simply not going to be a pair of triathlon sunglasses that can satisfy everyone’s needs ultimately. Instead of looking for the absolute best triathlon sunglasses, you are better served finding a pair that provides the most important benefits without significant downsides. That said, there are still a couple pairs of triathlon sunglasses that we saw which are either better than the others more generally or are more appropriate for specific, though sizable, niches. For instance, while there may be other triathlon sunglasses that suit specific racers better than others, the Roka TL-1 triathlon sunglasses provide by far the best overall performance that we found. For one, while they may not provide the absolute best optical quality, they are not too terribly far behind with Carl Zeiss lenses. On top of that, the lenses feature numerous types of protections as do the frames for durability and ease while you are racing. Of course, not everyone is as comfortable spending over $100 on a pair of sunglasses that could very well break which why we also recommend the Smith Pivlock Arena Max triathlon sunglasses. Though they may not necessarily be quite as durable as our Editor’s Choice best-performing triathlon sunglasses, these triathlon sunglasses provide just as many protections as many of our other top rated models while also being made out of top-tier materials, even if some of the more advanced technologies are absent. I'm a dedicated endurance athlete that loves marathons and Ironman triathlon. I come from a background of amateur swimming, but turned to triathlon and running back in 2011. The tally of marathons is now at 10 with a PB 2:58. I've completed 3 Ironman Triathlons with a PB of 09:42 attained in Copenhagen. Yan Jones here. A triathlete, who loves the best equipment for training. Running TRIGEARLAB to share unbiased guides, reviews and solutions. Some posts may contain affiliate links. TriGearlab.com is a participant in the Amazon Services LLC Associates Program, an affiliate advertising program designed to provide a means for sites to earn advertising fees by advertising and linking to Amazon.com.